Disruptive Innovator: Congrats to the 2014 SDL Tridion Community MVPs! Congratulate the new SDL Tridion MVPs (2014)! Share some Tridion community insight, this year in a mix of practical, inspirational, and old advice to the MVP 2014 crew. Today MVP Chair Nuno Linhares announced the new 2014 SDL Tridion MVPs. It was an impressive year as seen in some 1300+ questions and 2500+ answers on Tridion Stack Exchange, numerous blog posts, and so many examples that customers now ask me where to start rather than where to find information. Congrats and well done! 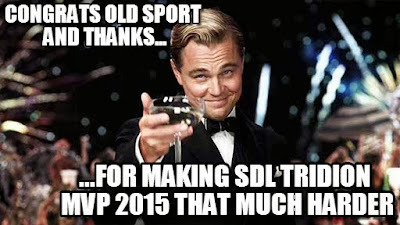 Congrats and thanks... for making SDL Tridion MVP 2015 that much harder! Current winners don't need a nomination for next year to be reconsidered in 2015, but should continue sharing. The award is only good for a year and winners are at least automatically re-nominated, but don't automatically win. Help yourself or others get over perfection and/or fear of sharing, know the selfishly unselfish reason to share, or just beeee a sharer. Compare congratulatory remarks with the 2012 or 2013 crews and understand the difference between the best Tridionauts and the best Tridion community contributions. See what the group and retreats are like. Laugh at the group's silliness, see how we played in 2011, read a "thank you" to Pousada Palmela in 2012, or visit the most recent 2013 MVP summit. Pace yourself and be practical. Know you likely suffer from the curse of knowledge and might be missing the forest for the trees. Re-use ideas. If people keep asking you to explain the same thing over again it means people still don't get it. Try again, try in a different way, or better yet, try online. Relax. Improve your craft but don't let "is it good enough" hold you back. No one knows exactly what you do nor does anyone have the same perspective. To paraphrase an infamous Tridionaut, don't apologize for being good at what you do (find the original quote on the MVP Linked-In group). I'll add, apologize for keeping your art from the world. Practice beats perfect and of course you can queue thoughts, posts, and snippets of code. Contracting is doing (often fun) work for others. Consulting is improving your client's condition. Thought leadership, as fancy as it sounds, isn't much more than sharing as you learn, create, or break Tridion. "You could share code," as a phrase that clarified what blogs could be. Instead of a post, a few made recordings, did screencasts, or drew on a digital board. Ask someone what he thought of your post. Btw, thanks to those that send me the occasional, "hey, Alvin, check this out" invitation. I'm glad if I helped but I'm honored that I got to preview your art first. Final crazy idea, for the program, your career, and maybe even your family (apologies if I'm intruding). One. I am but one participant, but there's also just one SDL Tridion Community. Replacing anonymous pronouns ("they") with actual names or roles can shape environments. One person can make a difference in one team, one division, or one company. One change. One post. One question. One answer. Then one more. And then another.